TrueCombat View topic - Elite Company - March Madness Event List! 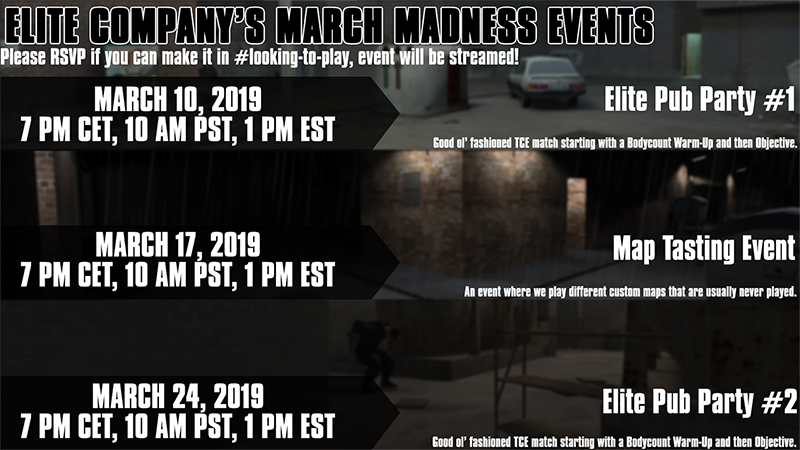 Post subject: Elite Company - March Madness Event List! Hello all, I told you I'd give you plenty of heads up before our next event and I aim to please. Instead of planning one event we planned 3 all at once within a week of each other so people will know way in advance what is what. Due to one of the events having a ton of custom maps a link will be provided on the Discord so people can download all the maps we're going to be playing all at once. Hope to see some of you guys there! Post subject: Re: Elite Company - March Madness Event List! Nice. I will share this information on the official TC facebook pages once I get on my pc. Here's the map pack for this month's map tasting event this Sunday! I'd like to see some more forum activity as well. Discord and FB are OK but sometimes an interesting topic occurs and just gets buried under a ton of other comments. I would like to see people using the forums too but forum based communities that have active users are few and far between these days and it doesn't help that the game this forum is for is dead.